The player controls "The Kid" a nameless heroine who must battles hordes of minions of a post-apocalyptic world. This is not a nuclear wasteland from Fallout, this is a playground where the land has been split into floating platforms, and the creatures roam free. 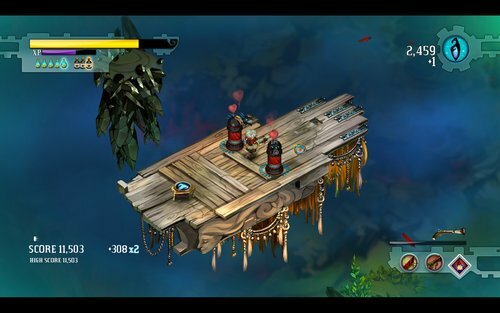 These floating platforms rise up from the ether as the player gets near, edging them to explore that space further. This works well as a mapping mechanic. Walk towards a ledge and nothing appears, then that must not be the correct path. The player can equip his character with a multitude of weapons, with nearly one new weapon being introduced per level, of the 15+ levels that exist. Each weapon has enough variation to keep the player interested in trying them all out. The player starts with a hammer, a high damage weapon that can do even more if the player uses it while stationary. He can compliment that with a weapon in his secondary slot, perhaps a bow and arrow for picking off long-range targets. My personal favorite was the mortar, with its range and nearly instant kill force, combined with the scrap musket. I'd first pop out a mortar ball, and then the scrap musket would push enemies back into the falling explosive round. Delicious. These weapons can be upgraded by finding salvageable through the lands, allowing them to become unbeatable forces of reckoning. Such upgrades can be chosen along two upgrade paths, maybe trading off potential enhancements of damage and spread for rate of fire, or reload speed. The upgrades are not generic 15% damage increases for every weapon and are personalized for the temperament of those weapons. The scrap musket, for example, can have its kickback greatly improved, while the hammer has an enhanced "focus", save attacking for a bit to power up a devastating attack. Both the weapons variety and possible upgrades add great replayability. Whilst one set can take you through the game, and probably will for the first completion, by the second play through you will be testing out different combos and finding which best suit your style. Your technique with the weapons will also be tested at optional trial stages, where unlocking parts can be rewarded for ace control and finesse under the stage conditions. Difficulty in the game is handled very intelligently. Rather than a chosen Easy-Medium-Hard constant determining the experience, the player determines the difficulty through a shrine. 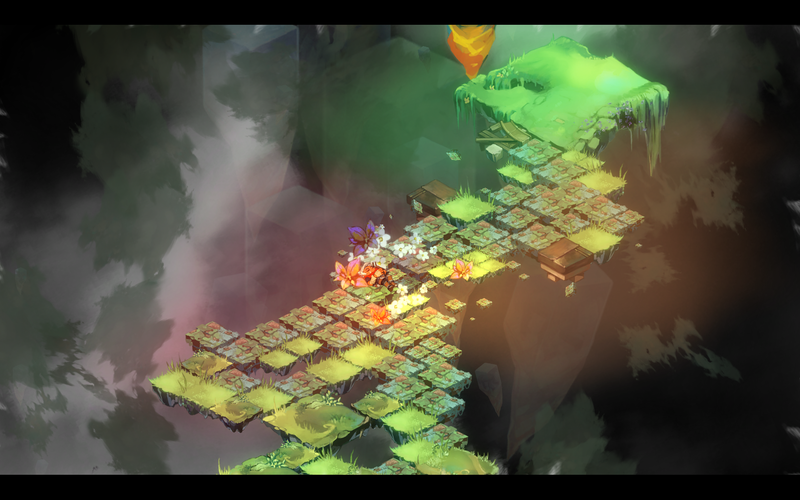 Here, the player chooses difficulty enhancements that not only increase the challenge, but also the potential reward, with more experience and money from defeating foes. These enhancements come in the form of martyrdom-style grenades upon enemy death or enemies attacking much faster. I've surprised that more games have not adopted this philosophy as it made the otherwise tame first-run through Bastion increasingly thrilling as I consistently upped the challenge to meet my proficiency. 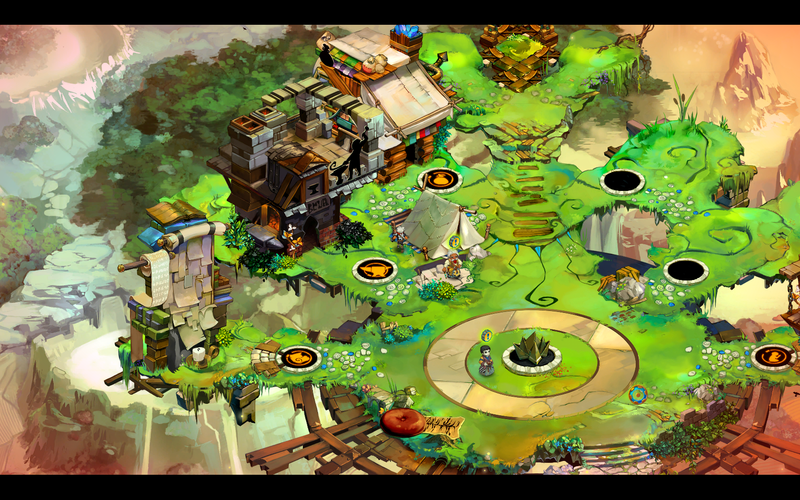 By far the best part of bastion would be the narrator. He is a more personable Riddick; a man who speaks poetically, but doesn't waste breath. His raspy voice serves as part guide, part reward. Not every action that the player does deserves a narrator response, but when the narrator does speak of such things, there's both surprise and glee knowing there's an "audience" looking over the player. The essence of the narrator is best through this dialogue writing. The diction and pacing is just spot-on. The dialogue connection was the problem with the Skyrim video's use of the narrator. They had the voice down, but the writing that describes the actions of the player, was fragmented to fit the video. From the player's smashing of boxes, to the selection of weapons the words are carefully tailored. These bits of spoken word don't just tell you what you know either; they build the background for the world, speaking of marshals and bushmen that the player will never meet. The narrator-story connection becomes closer in challenge dream stages, where the in-game's characters have their back-story told as they battle forward. The gripes I had with the narrator were that of his non-speaking. He is given a physical form in the game, an elderly man with gray hair. Yet, I could not find this visage connecting to this voice I was hearing. I cannot describe why, but I felt it each time I saw the narrator's shape that this must be someone else. Since, how else could they omnisciently tell what is going on through the levels? 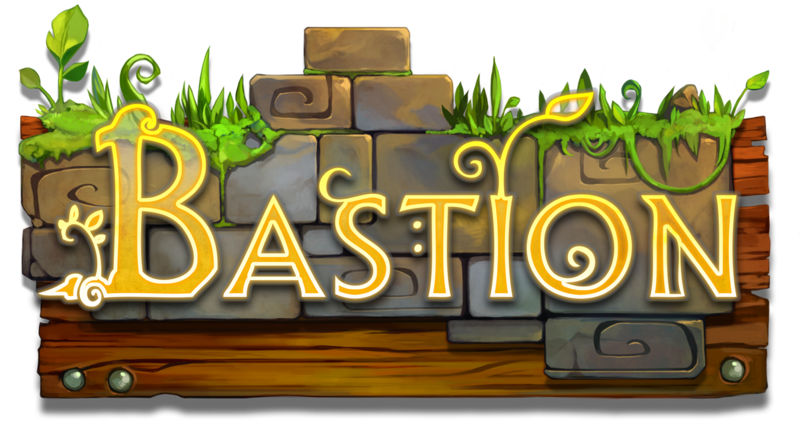 Bastion crystal ball? The second problem with the narrator is that he speaks for other characters. There is only one other speaking voice in the game, and even more interestingly, the narrator speaks for them initially, and then nearly at the end they speak for themselves. Why the developers chose to do this I am not sure, but it once more throws me off that the narrator is actually an in-game character. The music is not an atmospheric sort here, and is very prominent. 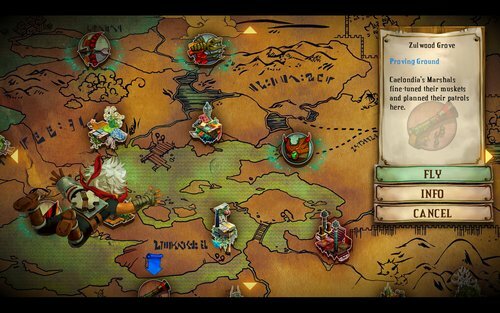 Each level has its own song set, and rather than the music complimenting the gameplay, the music makes the gameplay possible. The player is just a puppet to the environment and soundtrack as they trek on. This became clearer when I later listened to the soundtrack disconnected from the game. Alone the songs are ok, but the visceral connection to the art and game world constructs the masterpiece of the tunes. The songs are modern mixed with western flair in instrument choice, but some select pieces do have voice accompaniment that play directly into the game story. The vocals earn mention by the game's narrator for their historical significance but are the highlights of the soundtrack outside the game as well. Sadly, the low marks that steal the perfection relates to the enemies. While traveling around an uprising tiled world listening to the music jam and narrator speak could make this game, it would be over even quicker than it is. The weapon variety needs to be put to use, and that would be dependent on the enemies. The enemies serve as the impasse to the reward both in their inherent designed difficulty and in problematic choices. Firstly, the variety of enemies is good. There's a point about halfway through the game where every enemy changes to a new version that fits the same category. Floating gas monsters are changed into birds for example. Problem is the overall sucky attack designs of these enemies are kept during the transition. The main enemies of the first half, gas monsters that look like ghosts, exist in a couple types that change how they attack. Some spin their hammer around, some have a long charge attack, and some have a short charge attack. Most games have a color shift or some visible change to represent a different enemy to alert the player of the differences. For the gas monsters, the developers chose to vary slightly the color of the enemy's hood. This palette swap is so hard to see in motion and pick out, that chosen player tactics could be for the wrong enemy type! Try shield blocking a gas monster's spinning attack, and it turns out to be a stomp that sends the player flying regardless of their shield. Speaking about the shield, the degree of safety is not easily seen from the layer sprite. There are eight sprites for the player direction, but finding the sweet spot for completely blocking out the damage is not clear when enemies float right up to the player to attack. A personal motto of mine is that shields should either cover 100% of the player if a total shield bubble, or 180° if a forward facing shield. This lets players accurately plan which direction to face the most enemies to block them, rather than some enemies penetrating from an unclear 132° or so point. A sprite based game like this, which doesn't demand the precision of a first person shooter, should especially abide by that rule. While the multitude of weapons and upgrades are great, I find that the game is bias for the long-range weapons. Some of the enemies when surrounding the player in melee combat are relentless. Their large numbers typically surround the player, preventing accurate feedback about the combat conditions. Their fast movement and stacking covering 2D graphics also add to the confusion. One type of enemy who is especially irksome is the Stinkeye kamikaze. Their range of detonation is uncertain, and their explosive damage apparently stacks with the martyrdom grenades, which can lead to "What the heck just happened?" - Instantaneous death. Overall, as long as the player sticks with the ranged weaponry, they can partially avoid the game's weaker moments. Finishing off this review, let's discuss the graphics. This game was initially an Xbox 360 release, so I imagine many of the graphics were made with 720p in mind. However, the PC release does have 1080p support. Whether the graphics were all redone, I could not tell. The style though is very colorful and has a cartoony element to it. I say this because the player and enemies appear as if they are made in a 3D modeling program with their fluidity while the backdrops have a very hand-painted artistic aspect to them. This causes them to stick out from each other quite a bit. 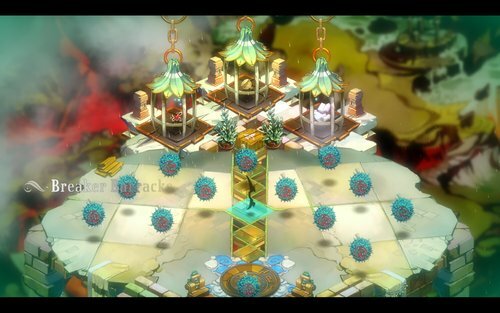 Despite the visible differences between player and background, the camera positioning of Bastion is troublesome. It can cause the player to think he is stepping onto solid ground when he is not, and vice versa. If the player falls off the floating platforms, they take a moderate health penalty and continue playing, so it isn't a one-step death like some games, but tumbling happens more often than I would like. Some enemies also destroy the ground platforms, so seeing where to stand requires some guesswork. Getting the proper angle of attack to hit an enemy also carries the burden of a fickle camera angle. I wouldn't say that adding world rails would fix the problem of the camera, and also removes the strategy granted by an enhancing game tonic, just that this is a natural irritation granted by an almost isometric view. The gameplay, graphics and characters are at medium standard.